Oh loo!!!!! Another one for the gallery show. I am madly in love with this one! The colors the texture. Sooooo delightful. You are so good with these materials This one sings Love it! Thank you, Jodi. You’re a good woman. I just love painting over something really bad……and actually getting a big step up on the new painting by the color and texture underneath. Really enjoying that part of the process! Wonderful as always, Laura.I really enjoy the textures of the acrylics. Thank you, Kerfe. And more, you shall have! Good Lord willin and the crick don’t rise. (Every time I say that it’s like my dad is still here lol) I can’t wait for my shipment of this stuff, nothing I’ve used beats it. Glad you enjoyed it. Ayayay! You’ve done it Laura!!! I LOVE all those textures and the yummy colors! Its like a badass cotton candy !!! Hahhaha. I have not read the post yet, but right off the bat when I was scrolling my reader, I saw some sort of ancient clay tablet and went it a second look and it was your art!!!! Okay, gotta go read post now. I like this one…how big is it and how long will your liter of play goop last? Lol! Love that term play goop! It is 5×7″ on a Blick canvas panel. Forgot to mention that in the post! Gosh, Dawn, I think that liter should last a very long time. Golden sent me a sample size which lasted for several paintings and this is like 32 or more times that. They have bigger tubs of it though lol! It really is wonderful. They told me yesterday it even works with oil paints. I was asking what mediums can go on top of it and didn’t dream they’d suggest oil. Do you ever use acrylic mediums with oils? Have you ever heard of this? This one is absorbent and even takes watercolor paint. But I know that every acrylic medium won’t do that. That is gonna be a lot of good playing. I am giggling about using other mediums with oils because I was just telling Margaret that my taste buds got super sensitive to sour and bitter so I quit using turpenoid even to wash brushes and I rarely rarely use linseed oil. I like gesso! But that is the extent of my medium experience. That’s really interesting. It’s amazing how these things can affect our bodies just by breathing or touching them. Gesso is definitely a lover! Wonderful stuff. I don’t know if turpenoid is to blame…if it is and I’ve stopped using it, I hope my taste gets fixed. Teri, I can think of so many worse things to be hooked on lol. I used to feel bad about spending so much on art supplies but it’s my only vice as my body won’t tolerate things like sugar, milk and wheat lol! 💜 I’m really glad you’re getting a kick out of my experiments! I’m just loving this stuff. Can’t wait for my order to arrive. Thanks, Rebecca! Glad you enjoyed! I aim to please. I can’t wait to get my shipment of this stuff so I have a whole bunch more to play with! TEXTURE LOVE. I might have to try out that gel, your painting looks great! Shana, thank you so much! I have so many gel products and mediums and this one is my favorite. The thickness is just right. I really hope you try it and let me know what you think! It really does look like fun, I will let you know when I try it. Thanks, Laura! I really like today piece. What are you doing with all your experiments? Framing? Thanks, Carmel! I’m planning to open an online shop, probably on Etsy. I’ve been saying this for a long time but I do plan to open soon, hopefully this month. Have you ever tried this stuff? This piece makes me want to go online to Blick and order every material you mentioned. I think you’re really on to something here. I agree with Kerfe, has the look of something ancient and mysterious. Bravo. N.
Nina, thank you! You just made my day, I’m so glad you like this! Seriously, this pumice gel is very cool. I can’t recommend it highly enough. It’s not too thick like many of the other products, not too thin either as it holds the lines well, and with that very fine pumice in there, it’s perfect. Absorbs watercolor, acrylic, you can draw on it too because of the tooth. There’s no end to what you can do, which is why I got a very big container. The color is not white, so you should know that going in. You can tint it with any medium you like or paint over it which is what I do. It comes out a light tannish color and dries a bit darker. Some consider that a downside, so wanted to let you know. You can find YouTubes demonstrating it too, so you know what you’re getting. With Blick you can always return it, even opened, which is why I love them. I hardly ever get a comment from both of you on my work, so I am smiling big now! I hope this one finds it’s way to hanging on your wall! Deborah, you made me laugh out loud with this one! Sunrise, sunset……and Star Trek. LOL sorry I can’t stop. 🙂 I want the link to your Etsy shop. This one could end up on my wall then! LAURA! this is one to have made into PRINTS!!! try not to sell the original!! I love this. this is really great. it would be a shame to just sell the original for a wee amount on etsy shop, then not get it made into mugs, towels, duvets, clocks, iphone covers, bags, totes, prints, calendars, cards. THIS is a great signature piece. don’t let it go, for a song! must go see yesterdays, right now!! brb! You excel in acrylics and with these abstracts, and especially these last two I can actually say that they (you, actually!) are “maturing” or stepping into an advanced realm…..I think that I am searching for another expression but it is not coming to me. Oh boy, sending prayers up! I hope you’re getting some good reading time in! I hope so….in the evenings and as soon as I can get to my Kindle, I am reading! Love this Laura and the mood set by the colours it has a calming feel to it, thanks for sharing the process and products too. Thanks, Kath and you’re very welcome. Really glad you enjoyed it. I love rescuing paintings when I can. Thank you so much, Ann! I think covering the old painting up really gave it the depth that I miss many times because I don’t take the time or completely understand how to get it on purpose. I’m learning tho. Glad you like and yes, this acrylic paint and the texture products are my medium, at least in painting, I do believe. I know WC is not lol! Ann, you’re so sweet! And you are so right about the layers. I like to do just one with wc when I can get away with it, so this is still new to me, but I really just keep layering until I’m happy…..sometimes that means many many layers lol but I love that it’s never over with acrylics. Yes, when is your gallery show? You have amassed quite the body of work! Thanks, Tierney. Haha, well I appreciate your vote of confidence! I have a lot of very small paintings that would be lost on big walls but I have no idea where this train is going. Thanks again! Fabulous and dreamy looking, love this piece. Thanks, Haunani! I just love it when I can save a painting and have great built-in texture from the start. So glad you like it! Thanks, Charlie. I’m hooked on this stuff! More to come. 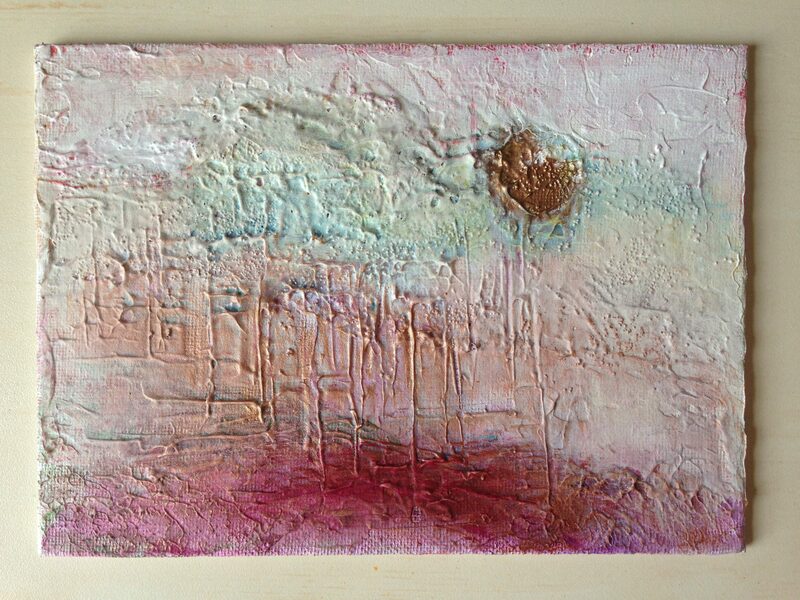 Another beautiful abstract, with creamy color and touchable texture! I love it!! Thank you so much Jenny! I really appreciate you stopping by and commenting! It’s a beautiful painting! I love the mood!